Prototype Motorola Android handset gets snapped - or just a bad photoshop job? There is no secret that Android mania has engulfed Motorola as they keep on cranking out all of these devices. Now there seems to be a photo floating around that's said to be a prototype Motorola Android phone that is accompanied with a peculiar story. Just taking a quick peek at the image snapped of the alleged device, it has some similarities to the recent Motorola BACKFLIP – except for the noticeable affinity for a square shaped appearance. It's difficult to tell how the portrait style QWERTY keyboard gets exposed – it could be anything like a simple sliding, swivel, or backflip-like action. 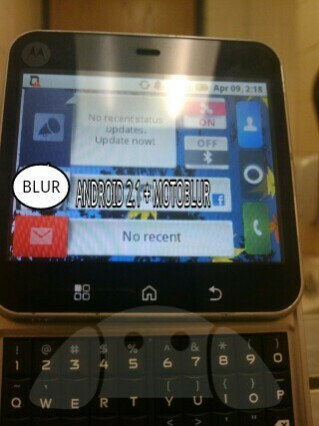 As far as specs are concerned, it's heard to feature Android 2.1, MOTOBLUR, and either a 3.2 or 5-megapixel camera. Now the interesting thing about all of this is the story behind how the photo was taken. The source says that it was snapped after his buddy's father, who works for Motorola, let him take the phone to school to use it as a calculator for a math test. If it were really simple to take out a prototype Motorola phone from the inner depths of their secluded labs, then we'd probably be seeing plenty of leaks all the time – either that or you'll start seeing people using them more often for exams. Then again, the photo could be just the creation of someone with a lot of time on their hands. nahh..thats only gonna sell to teens! So ugly it's not even gonna sell to teens. That's not the Nokia Twist? I can believe that is an Android screen, very Devour-like icons. That Blur and Android2.1+Motoblur seem to be hiding info, obviously not part of the device screen. But I agree, not an attractive phone at all. Looks interesting. Probably still early in its development though. The story about the leak is pretty sketchy though. It's sounds pretty accurate to me, I mean if I needed a calculator the first thing I would think to take is a stolen prototype phone. Still in development. Needs a lot of design development to keep this phone from looking completely hideous. It's real. Bank on it. After looking at the picture closer the split in the keyboard it might be a very early version of the MOTO Split.